The flag representing the historic county of Yorkshire has been hoisted outside the department's offices to celebrate Yorkshire Day. The Battle of Minden was fought on the 1 August 1759 and soldiers from the 51st Regiment of foot (a Yorkshire regiment, first raised in Leeds in 1755), played a significant part in the victory gained. Reports from the period suggest that the soldiers picked roses and wore them on their uniforms, either during the battle or afterwards. The white rose has long been a badge associated with Yorkshire. Some regiments still remember the battle, on its anniversary, as Minden Day and wear roses on their uniforms. Those with Yorkshire connections wear white roses on their uniforms. When the Yorkshire Ridings Society first promoted Yorkshire Day, in 1975, it highlighted the link with Minden Day, also 1 August, because of the use of the rose by the Yorkshire soldiers who fought in the battle. Within the borders of the historic county of Yorkshire are areas which are widely considered to be among the greenest in England, due to the vast stretches of unspoiled countryside in the Yorkshire Dales and North York Moors and to the open aspect of some of the major cities. This has led to Yorkshire sometimes being dubbed ‘God’s Own County’. To celebrate the important place counties play in the nation’s cultural heritage Secretary of State Eric Pickles has asked that English county standards be flown alongside the Union Flag outside the Department’s Eland House headquarters in Victoria. Flags are being flown for a week at a time in alphabetical order or - in cases such as Yorkshire and Cornwall - to coincide with particular county days. England’s counties continue to form an important part of our cultural and local identity in this country and many people remain deeply attached to their home county. This sense of pride and shared identity is one of the things that bind communities together. I began this initiative by raising the flag of my adopted county of Essex and it gives me immense pleasure to see the flag of the county of my birth, Yorkshire, raised as the final county flag to be flown. The historic English counties are 1 of the oldest forms of local government in western Europe. Their roots run deep. And no amount of administrative reshuffling can delete these longstanding and cherished local identities. As a proud Yorkshireman, by both birth and upbringing, I am more than happy to support any event in that recognises 1 August - Yorkshire Day. As have City of York Lord Mayors in the past, I will be celebrating Yorkshire Day with many Yorkshire Civic Parties with a church service and lunch in the City of Wakefield this year. I send everyone in Yorkshire best wishes in their celebrations on 1 August. The flying of county flags outside the Department for Communities is a timely reminder of the importance of counties to the people who live in them. Counties are widely used to identify locations in radio, TV and newspaper reporting. However, maps which show the counties are few and far between. Similarly, county boundary signs have often been removed where they do not coincide with modern administrative boundaries. Societies such as the Yorkshire Ridings Society and the Association of British Counties continue to campaign for the marking of county boundaries on maps and on the ground. Older than many of the monuments and historic buildings on which money is lavished to preserve them, our counties require only that they are recognised for them to remain an important part of our heritage and our daily lives. 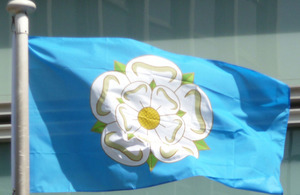 The Yorkshire flag has been kindly loaned by the Yorkshire Ridings Society, at no charge.